I knew I'd end up doing an article about this eventually. I just can't fight it any longer. 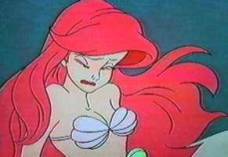 I am now going to go through my top 10 cartoon women. These are the 10 that if I were a cartoon I would stare at across a club and hope they came and talked to me as I'm far to rubbish to actually make a move myself, although let's be honest, they'd probably already have dates so I'd just stare jealously and hope their boyfriend wasn't Superman and going to notice! And for any non-cartoon women who are reading this I shall be doing a follow up article on the top 10 cartoon men I'd most like to emulate, either in looks or attitude and I shall be willing to listen to any suggestions. So think about which cartoon men you think are cool or hot and let me know! 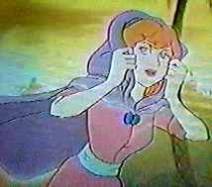 Hmm, [probably one of the earliest cartoon women I came across that I found attractive. Looking back now firestar isn't as good as I remembered. Whilst those glasses looked interesting and cool when I was young, now they just look like a pair of Dame Edna's knock-offs. But on to her plus points. Well, she has the big red hair (case no.1), a cool name and an all in one flame coloured catsuit. Always gonna be a plus that. But the biggest plus for her is she got hang out with Spiderman! Originally it was going to be The Human Torch but the people behind the show were worried impressionable kids would set themselves on fire. They didn't consider the thought of kids getting into freezers or trying to leap between buildings using string that perilous apparently. Speaking of peril I'd have thought Iceman would have kept more of a distance. Anyway, due to the human torchs absence we were treated to Firestar so it ended up better than expected I say. Not only was she a superhero and attractive but she was also smart. Going to the same college as Peter Parker, studying science I think. Her only down point (other than the glasses) was her annoying dog. So for the sake of nostalgia Firestar makes the list. Whilst I was never too in awe of Shiela, one of my friends has described her as his "perfect woman". Apparently she is perfection incarnate and no real woman could ever get close to Shiela. So for the sake of his mental health alone I have included her here. Lets see, she has that nice mini dress and the knee high boots so you know she isn't as niave and innocent as she'd have you think (makes you wonder what she doesand where she goes when she has that invisible cloak on). She was also the sweetest of the bunch from this cartoon. Looking after her younger brother must have been a chore (especially as he was such a little git and don't get me started on that damn unicorn!). Another example of the red hair you'll notice. In the picture above left Ariel is obviously annoyed that she is only placed eigth despite being the most naked on the list. 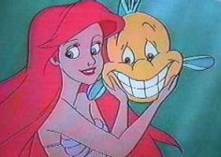 People sometimes object to my liking Ariel because (as they love to point out) she's half fish. But I'd remind them that she gets rid of her fishyness at the end of the film and is none the less lovely for it either. One might even say it was an improvement. Anyway, yet again we see a character with large red hair. I'm beginning to think it is a conspiracy! She also has that cool shell bikini top. Personality wise she was always nice and inquisitive. Very independant, trying to find out stuff on her own and disobeying her father. When she reached land she also became full of cute quirks when dealing with the prince. (Mainly due to the loss of her voice admittedly). Plus she got to hang out with a reggae singing crab. How cool would it be to know someone who had one of them! Now this was quite a surprise to me. The first placement who doesn't have redhair happens to have my least favourite hair colour. Namely blond. Oh well. Anyway for those who don't know, Princess Adora is She-ra when she isn't being She-ra (like He-Man is really Prince Adam). Even though She-ra has that cool backless mini dress outfit, I always preferred Adora. Her hair isn't quite as unbelievable and she had the nicer voice. She started out as a Force Captain for the Horde before learning how wicked they were (didn't the name - The Evil Horde - give it away?). She then got hold of the Sword of Power and realised her destiny by learning to become She-ra and went off to help the rebellion. She is an original Riot Grrl! Aah, Princess. One of my early loves. First of all she wears pink, which is a cool colour! (It is my belief that all women should be forced to wear either black or hot pink lipstick!) Then she has that weird bird cape and helmet and short skirt to look extra good when striking dramatic poses. To top it off, when she is just dressed normally she has black hair with cool flick ups and gorgous large green eyes. 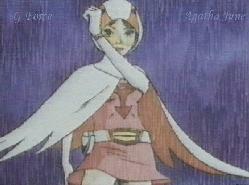 Battle Of The Planets was a cartoon I used to love watching. I don't think I ever followed it completely I just remember that apart from the bad guy Princess was my favourite character. But after recently seeing pictures of the others I don't think she had much competition. They don't look like the most competent bunch. Ah well. And now CLICK HERE to proceed to part two and find out who is my current No.1 cartoon Woman of them all!